My mornings are sometimes a blur because it's a mad rush to get the kids to school. Most mornings I am busy packing their lunches while they have their breakfast. So, breakfast has to be something they can grab quickly. I try to make a batch of pancakes on the weekends and freeze them so they can easily heat them up and eat them. 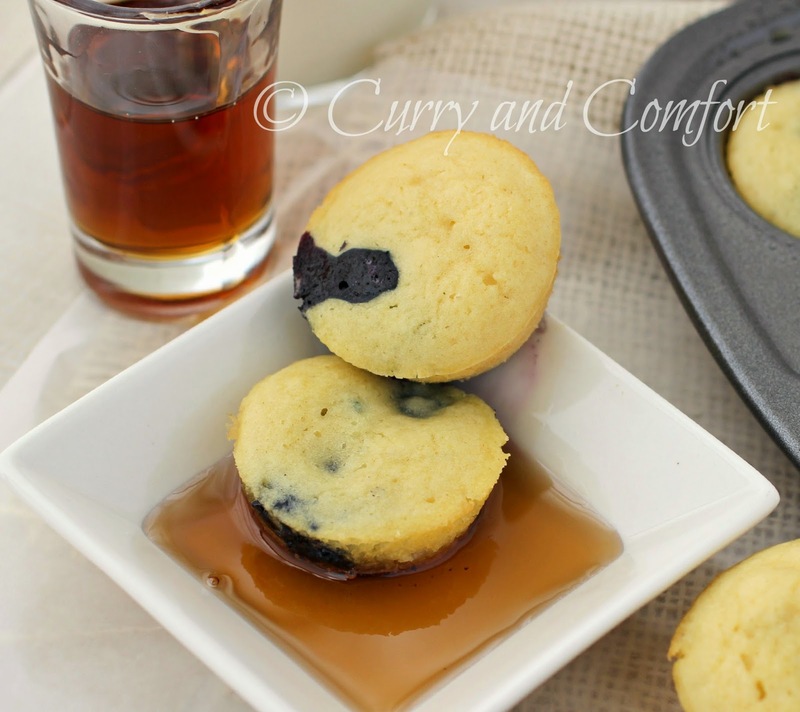 Then I realized a mini muffin pancake would be much easier for them to eat and they could even take some (without syrup of course) in a baggie to eat on the way to school when we are really rushed in mornings. Making the muffin pancakes are so convenient because you don't have to stand at the griddle and deal with making little tiny pancakes. The muffin tin just has to be filled and the oven does the work. You can even freeze batches of these baked pancakes so they to be heated up there for any morning the kids need breakfast fast. Mix the dry ingredient. Then mix the wet ingredients. Mix the dry ingredients with the wet ingredients gently to form a batter without over mixing. Stir in blueberries. Grease the wells of the mini muffin pan with butter. Use a tablespoon measuring to pour enough batter into each well so it comes 3/4 way up to the top. Bake in a 375 degree oven for 12-15 minutes or until pancakes are cooked through. Allow pancakes to sit in for a minute before popping them out. Serve with some warm maple syrup for dipping. 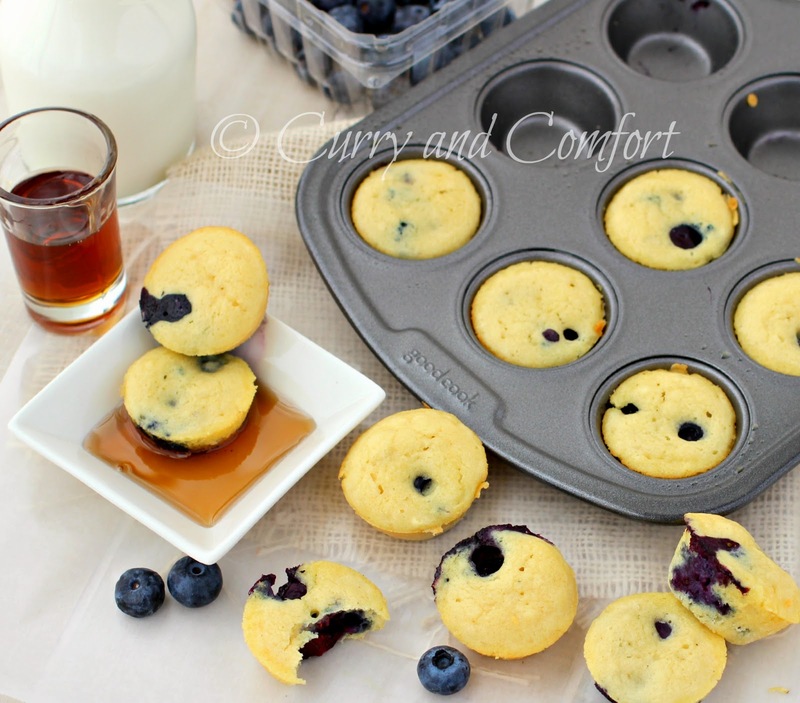 To make ahead: Allow muffins to cool down and them place them in a baking sheet and freeze for an hour. Once frozen, put into a freezer safe Ziploc bag and store. To heat, just place them in a toaster oven to eat through and serve. What a great idea!! Sounds amazing! My mornings are pretty hectic too - these are perfect for busy mornings! Great idea! 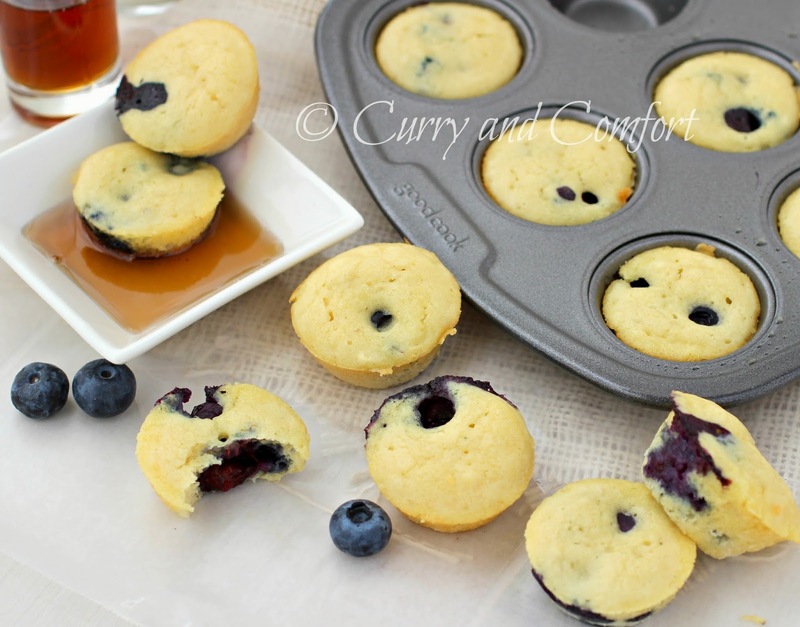 These mini-muffin pancakes are such a great idea. I used to freeze pancakes and waffles, too, for easy breakfasts when my kids were growing up. The kids would have LOVED these muffins. What a fun change from regular pancakes! I need something quick and easy to grab in the morning otherwise no breakfast for me. Love these! What a fun breakfast idea! 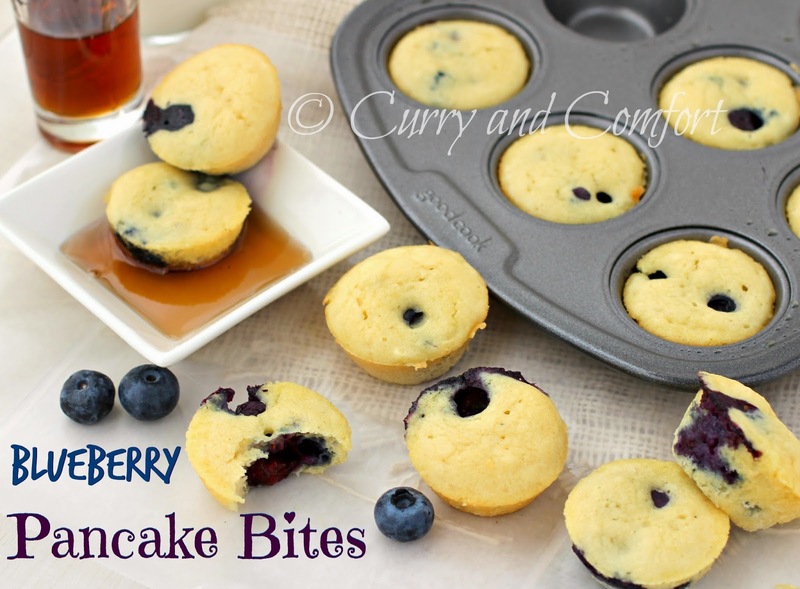 My daughter (the muffin and pancake queen) would love these! This would definitely work for me! We love pancakes but sometimes dragging out the grill and standing forever isn't the most fun thing to do.